Make your Sales Boom all Year Round! Using a Magento 2 Gift Card extension will be helpful for online stores this holiday season. It allows admins to create Gift Card samples and configure them with ease. Beside this, electronic gift certificates can be personalized by users and more interestingly, they can be bought with much lower price. As a result, this motivates gift voucher users to buy more. Furthermore, Gift Card extension can help store admins manage gift codes, discounts, gift card usage and other gift card features.
" My customers even gave feedback that they were really satisfied with the flexibility in creating their own gift card templates"
"... this extension can’t be omitted in an online store ..."
"... I’m 100% pleased with premade gift voucher templates, they look good and useful ..."
Buyers are allowed to personalize their gift vouchers by using their own photos as templates. .gif, .png and .jpg files are supported. Buyers can choose to send digital gift vouchers by SMS, emails or via online messengers such as Whatsapp, Viber, Facebook Messenger or Tango. Otherwise, physical gift cards can be printed out and sent via post office. 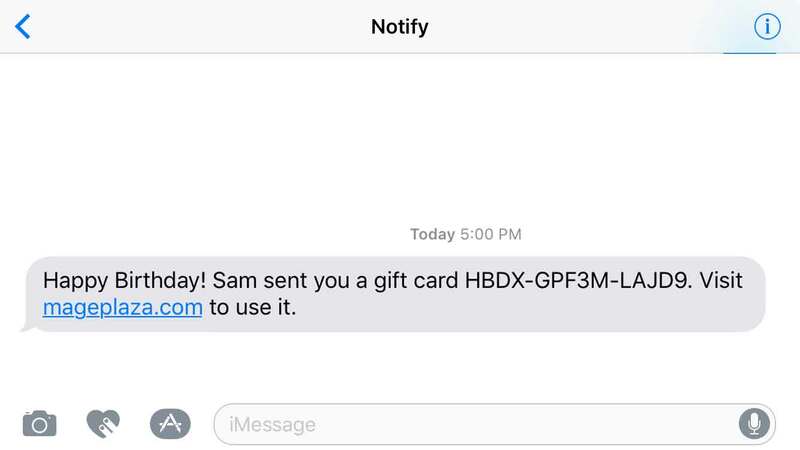 Allows admins to send SMS to gift card recipients about card’s status. Messages can be customized to appear as personal SMS with customer name. Screenshot. Customers can use the coupon code or print the gift card at home to use at the local store. Q. How is Gift Card / gift voucher supported for offline payment? Your customers can use gift card as a payment method for online and offline orders. With offline orders, recipients only need to present gift codes or print cards out as normal gift vouchers. It is so convenient, right? Q. How to change Gift Card layout? Gift Card layout will be chosen instantly in the frontend by CMS Static Block, there are some pre-made layouts that are available to pick. 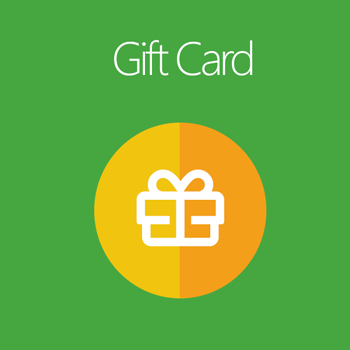 Moreover, admins can easily drag and drop to design new gift card layout templates. Q. How many gift card codes can shoppers apply? There is no limit for gift codes. Your customers are allowed to add multiple codes as they have. In addition, the remove is so easy to implement. Q.`Is Gift Card compatible with Gift Wrap? Yes, definitely. 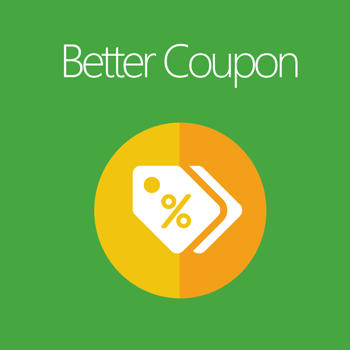 Besides, it is also compatible with Better coupon, OneStepCheckout, Store credit, Email Attachments, etc. Q. What should I do if my gift code is stolen? Don’t worry about that! The gift code is secured tightly by replacing the part of code by X symbol. Q. Can I offer an expiration for any gift card / gift certificates? Q. How many gift codes can I generate at the same time? Yes. Mageplaza Gift Card is compatible out-of-the-box with Magento Open (Community), Magento Commerce (Enterprise) 2.1.x, 2.2.x, 2.3.x. Great product and great service! We had an issue on installation that was fixed very quickly by support. Our shop was in need of this. We were able to get up and run with gift cards immediately, just in time for the holidays. Also, you can get the professional installation from them if purchasing their installation package. Gift Card extension is very easy to use. I love it!! Customers can buy gift cards and send to friends!! It's still new, so I didn't see it in real action. It's exactly what I was looking for. I love the fact that we can now use it to apply the credit toward an account. Also, Mageplaza offers a great customers service and support. Good product with the fast support. I have seen a problem form our side. I got it rectified by the support. I recommend you should add this extension to your store for creating and managing gift cards. Support was very thorough. Took a minute to get past a few small issues, but seems well thought out. I like the options, and the balance of features is better than other brands I've used. Great extension that makes it really easy to Gift Cards. Now our online shop looks very professional. Simple installation and very good manual. I ordered more extensions and had a positive experience everywhere. I’m surprised by what this module has done in my store. All the functions mentioned work perfectly. And I’m 100% pleased with pre-made gift voucher templates, they look good and useful. I’m also glad to know that I can even drag and drop to design my own samples or let my customers create their owns. Moreover, Mageplaza support team did well to help me deal with some problems. Thank you much! I have to send my compliment to Mageplaza for this extension. Everything is working well and precisely and we’re looking forward to seeing a boom in our revenues this upcoming holiday shopping season. Some of my customers even gave feedback that they were really satisfied with the flexibility in creating their own gift card templates. So I hope you can optimize this feature more in the future! Thanks again! Admins are able to adjust sizes of fields shown on the card. If your shoppers do not like a one-size-fits-all gift voucher, Magento 2 Gift Certificates extension assist you on establishing gift card credit which is used as same as a credit card in your store. 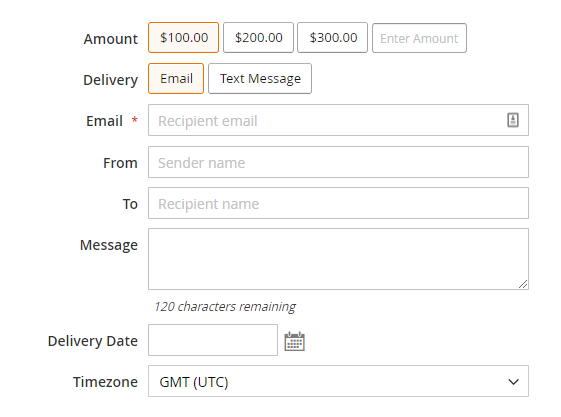 In addition, store admin can enable shoppers to redeem gift codes to their account balance in the backend. An e-gift card plays a role as both gift voucher and postcard for your customers. Therefore, Gift Card extension allows shoppers to write wishes and gift message before sending. Gift Card extension support 3 types of gift card for your visitors to choose: physical, virtual and combined gift cards. These 3 types of the gift card are adaptable and suitable for every shopper in every situation. Either your shoppers want to send their gift card through email or post office, Gift Card extension absolutely can do it for them. Your shoppers will be definitely excited with a lot of eye-catching templates for choosing. The template will appear instantly when being clicked on by shoppers to preview. Moreover, Your shoppers can also upload their prefer image instead of using default templates.